All businesses, if they are to thrive, need some form of marketing. All Quaker meetings, if they are to thrive, need some form of Outreach. What sort of things can you do to encourage Outreach? What sorts of things can you do to encourage marketing? Why might you hesitate before doing anything? Many years ago, while Clerk of Quaker Outreach London (now London Quakers), I wrote “A Quakerly Guide to Outreach” which gathered together many ideas about how to do Outreach. I pointed out then (2005) that whilst Outreach certainly was hanging a large painted banner outside the main entrance to Friends House during Yearly Meeting or organising a group of Quakers from all over Britain to stand holding vigil in the grounds of Euston Station… it is also the friendly comments to newcomers, ensuring the loos are well signposted and that your Meeting House exists on any local maps. Whilst on Quaker.org.uk/outreach you can not only read their point, ‘Outreach is the sharing of information on Quaker convictions, beliefs, practices with the general public.‘ but download the extremely useful and free Outreach Pack. 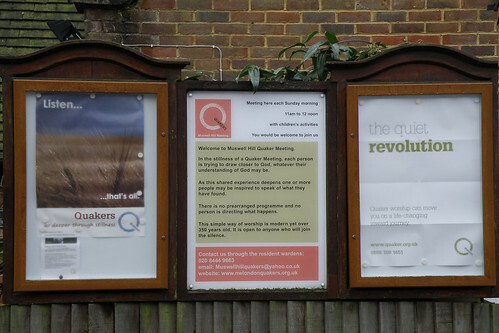 If you see the sign and poster in the photo above you might think it is almost all Outreach – fairly traditional three panel sign, complete with posters supplied by Quaker Life, a central panel giving times of Meeting for Worship plus a bit of a blurb about what that is… However, there are also two bits of specific marketing. First and most obviously, there is a small (not readable in the photo) A5 leaflet tacked underneath one poster which gives a bit of blurb about the building as a venue. Whilst the other – perhaps not even noticed bit of marketing, is that there is a sign there telling you that this place exists and that things happen here. It’s the first more specific type of outreach – posters, leaflets that most people consider when they think about raising the profile of their Meeting. That’s well supported by the centrally funded staff who work at Friends House. However, in my next post, I’m going to concentrate on Marketing the building as a venue specifically whilst also mentioning where I see the two aspects overlap. This entry was posted in Blog, Marketing, Wardening and tagged Blog by Wendrie Heywood. Bookmark the permalink.